I should probably confess that I have a positive bias towards monsters. No, seriously: I love them. So I was really looking forward to this anthology. At the same time, I was a bit worried that there would have been stories in which the monster was merely a pretext or, worse, a not-too-subtle metaphor. I am very pleased to say that this wasn’t the case. The editors selected a number of solid horror and/or supernatural stories full of proper gore and terrors. No delusional characters, no humans that are “like monsters”. Only the real deal. Almost all the monsters in these stories would kill you, if they had the chance. And they’d do it with a lot of pleasure. The anthology opens with J.C. Grimwood’s “Herne,” an atmospheric story taking place in a dystopian London. The fascinating image of Waterloo Station overtaken by wild vegetation keeps coming into my mind each time I happen to pass by or through it. “Vika” by Anne Michaud is an elegantly written tale about the chief of a Viking tribe and the process of christianisation of its village and the whole area. Maybe not terribly bothered with historical accuracy, but definitely a good story on ancient gods and the double-sided gifts of black magic. “Nimby” is a disturbing story by Hannah Kate, in which the main character is so unsympathetic to be almost physically irritating. It is a bit of a risk for the author to rely on a protagonist so unpleasant, but Kate manages the story very well, and even adds a lovely twist towards the end. “Broken Bridges” by James Bennett is probably the creepiest piece in the anthology. Told in first person, from the monster’s point of view, it features a very interesting narrative structure alternating what happens in the present with older memories of the protagonist, leaving the reader filling the (horrific!) gaps in between words. “A Very Modern Monster” by Aliya Whiteley is another interesting, and nicely written, variation on the recurrent theme of the beast in the woods/moor. A subtle sense of uneasiness accompanies the reader from the first page, growing and becoming more and more unsettling as the story goes on, in a very convincing example of literary suspense. “Fly, My Dear, Fly” by Nerine Dorman is one of the longest and more complex stories, and, also, the one with the most genuinely blood curdling scene in the whole book, counterbalanced by an unexpected ending. Skip it if you’re afraid of birds! “Upon the Wash of the Fjord” by Byron Black is a short story where the author plays the card of misdirection effectively, showing that there can be more than one unrelated mystical creatures in a story and that they might hide (metaphorically, of course) in the least predictable place. In “Mélanie,” Aliette de Bodard moves an old medieval myth to one of the speculative universes that she seems to create so gracefully and effortlessly. As all good stories, “Mélanie” (the only reprint in this volume) can be read on more than one level: not only as a well-crafted monster tale, but also a reflection on diversity, and on the complex process that brings us to understand what we really need to be happy. Krista Walsh’s “Moments” is the only story in the anthology that hints at the possibility that the monster never existed, but in a such vague and ambiguous way that I can still like it. When I was almost at the end of the book, I found my very favourite story, which is not necessarily to say the best, but the one that I enjoyed the most for the beauty of the plot, the melancholic nature of the characters, the surreal dialogues between the old amputee sailor and the stubborn mermaid, and the intensity of the sorrows that, in the end, bring them close. “Old Bones” by Peter Damien is a moving, beautifully told story that plays with the tradition and the prose of sea tales, leaving the reader with a broken heart and a bitter-sweet smile. I was less convinced by the comics. I imagine that it is quite challenging to write a good one in the space of few pages, but “Serpent Dawn” by Adrian Tchaikovsky and Eugene Smith (artist) fishes a bit too much on stereotypes, although I enjoyed the graphic style and the characters of the two badass female “fixers”. I wasn’t very fond of the second comic either, “Mother Knows Worst” by Jasper Bark and Fabian Tunon Benzo (artist) which is the only story that builds on the idea of humans as monster. Luckily, the presence of a proper, big, murderous creature at the end partly makes up for it. The illustrations are well executed and do add to the stories, especially, but not only, the amazing watercolours by Daniele Serra, also the cover artist. It is a pity that, in some cases, some of the details seem to have been lost in the passage from colour to black and white, and in the printing on porous paper. The only thing that disappointed me a little in this collection is the predominance of stories set in Northern Europe or written by Northern Europeans. I guess that writing in English is far more common in those countries, but the Nordic atmosphere and the Anglo-Germanic or Scandinavian imagery seem to prevail: frozen cities, cold winds against rocky shores, foggy moors. What about the terrifying things under the burning sun? 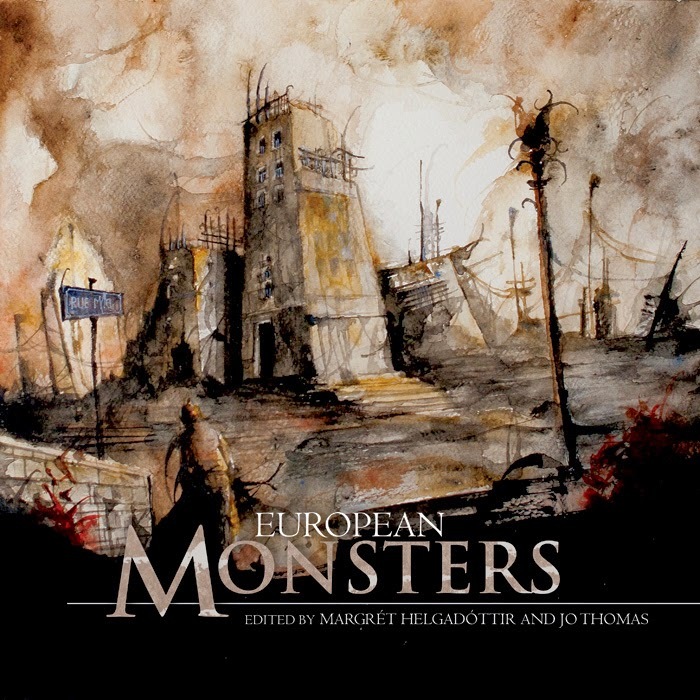 I was looking forward to finding out which Southern European monsters had made it to this beautiful anthology. Sadly (for me!) only one of the comics is set in Greece (“Mother Knows Worst”) and one of the stories in Venice (“The Cursed One” by Icy Sedgwick). In both cases, though, the protagonists are tourists or foreigners, which is fair enough, as the authors don’t sound very Greek or Italian either. But I’m sure there are more voices in Europe, and many awesomely creepy and cruel monsters that live in the Iberian peninsula, in the Balkans, in Mittel-Europe, all waiting to scare the life out of you.